Our API composes over 20 services – some public (S3, Twilio), some internal (run a process, map DNS record to an app) and some provided by third parties (provision New Relic to a new app). Amazon operates some of the most reliable services we consume, and yet if you make enough calls you'll see a request hanging for 28s. If there's one thing I learned operating a large-scale app for years is to just expect incredibly high tail latencies, 500s, broken sockets and bad deploys on fridays. Fuses and circuit breakers were introduced to prevent house fires: when electrical wiring was first being built into houses, people would sometimes plug too much stuff into their circuits, warming up the wires – sometimes enough to start a fire. Circuit breakers automatically detect this destructive pattern of usage, and interrupt the system before things get worse. So the idea with the software pattern is to wrap external service calls and start counting failures. At a certain threshold the circuit breaker trips, preventing any additional requests from going through. This is a great moment to fallback to cached data or a degraded state, if available. Both sides can benefit from this: your app becomes more stable as it saves resources that would otherwise be spent calling an unresponsive service – and the receiving end will often be able to recover faster, as it doesn't have to handle incoming traffic during outages. The reason I wrote this gem is because all circuit breakers in Ruby tripped after a specified error count. While simpler, these breakers just don't scale well in production: make 10x more calls, and your circuits will open 10x more often. Avoid this by specifying the threshold as a percentage, which is in fact what Netflix uses. Enough talk about what are circuit breakers and how they're implemented. Just like every other operational pattern, you should expect to spend only a fraction of your time writing code. Most of the effort goes ensuring a smooth deploy, and monitoring your production stack. Introduce logging-only circuit breakers at first. You'll want to review and tweak their parameters before affecting production traffic. Expect to run into surprises. In particular with internal APIs, where availability might not be as well defined or understood, you might see breakers changing state often. This is a great time to bring visibility into failures to other teams in your ecosystem. You obviously want to know when a breaker trips. For starters this could be as simple as sending an email to the team, although in the long-term the best way to go is to inject circuit breaker state changes to your monitoring infrastructure. But beware of race conditions when capturing circuit breaker state changes! CB2 and all of the libraries I've seen do not guarantee that only a single process will detect the state change. You'll want to use a lock or similar mechanism to avoid sending duplicated emails or annotations when circuit breakers trip under heavy traffic. Services operating slowly are often more damaging than services failing fast, so in order to get the most of this pattern you'll want to specify timeouts for all service calls. And be explicit about them! most HTTP libraries have timeouts disabled or set really high. 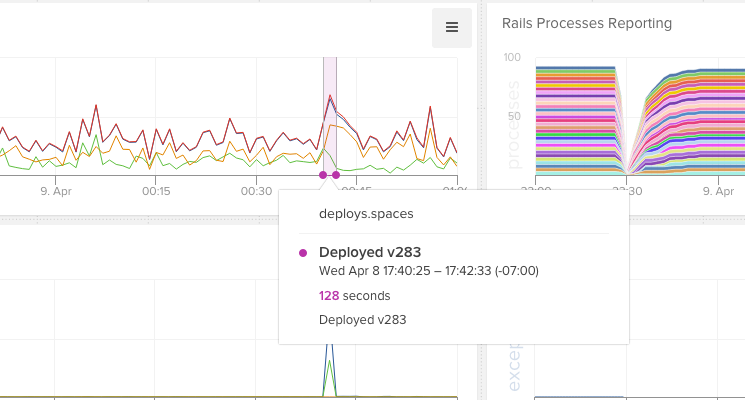 By the time you start seeing one-minute timeout errors in your logs you're probably already dependent on slow responses, which is a big part of the problem here: introducing and lowering timeouts in large-scale apps can be quite challenging. You should also prefer timeouts set as close to your network library as possible, be it Postgres, Redis, AMQP or HTTP. At least in Ruby the generic timeout is just unreliable and should be used only as last resource.